This afternoon, we were notified by #ROC ATC of a possible aircraft down in Rush. Two Airport Firefighters immediately responded with Rescue 5 to assist Rush Volunteer Fire Department and others at the scene. After an extensive search by several fire and law enforcement agencies, it was discovered a local resident had been flying in the area earlier in the day and did not require any assistance. Our members are glad that this incident turned out the way it did. This is the second consecutive day that Rescue 5 has responded off-field to assist another agency. As we’ve stated before, this is a testament to the inter-agency cooperation that exists in our area. Several law enforcement agencies responded to a field in Rush Saturday afternoon, after it was believed that a small plane may have crashed in the area. Rush, N.Y. - Several law enforcement agencies responded to a field in Rush Saturday afternoon, after it was believed that a small plane may have crashed in the area. 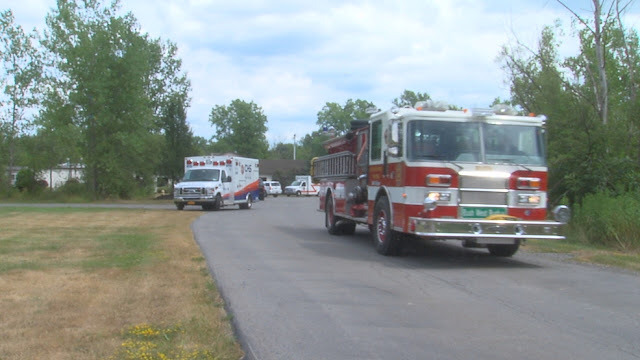 Monroe County Sheriff's deputies arrived to the area of 7465 West Henrietta around 2:30 pm, after a small plane went off the radar in the vicinity. A State Police helicopter, along with members of the Rochester/Monroe County Airport Professional Fire Fighters Association assisted in the search for the plane. Turns out, a resident in the neighborhood had been been operating the aircraft, which he safely landed on his property without incident, according to deputies.